EB-5 (the fifth employment-based preference immigrant visa) Regional Centers are private, public or government entities designated by the United States Citizenship and Immigration Services (USCIS) that sponsor capital investment projects. One of the main advantages of a regional center is that the center can benefit from indirect job creation by setting up an investment fund for multiple investors and eliminating the need for individuals to invest in projects directly. Regional centers are a good choice for investors whose main objective is residency status rather than hands-on management of a project of their own and the program allows the investor to apply for a visa for immediate family, also. Regional centers are often considered passive investments, giving investors the freedom to choose where in the country they wish to live and the degree of day-to-day involvement they want to have. EB-5 Regional Center are able to provide investors and their families with a certain degree of immigration security and flexibility with regard to unrelated employment. Regional centers can use economic modeling and market impact planning to determine the indirect and induced jobs growth spurred by the investors capital contribution, making it easier to meet job creation requirements. Created by Congress, the EB-5 immigrant visa category is for foreign investors who go through a detailed qualification process and are investing in businesses that will improve the U.S. economy and result in or preserve 10 or more full-time jobs per applicant. The capital required to invest is $1 million, though it can be as low as $500,000 if the investment is made in a sparsely populated or employment-suppressed area. Although about 10,000 EB-5 visas are made available for foreign nationals entering the U.S. in a given year, Regional Centers have 3,000 reserved for their use. In recent years, the Regional Center program has been a proven success, and it continues to flourish as its investors contribute to the growth of the U.S. economy. Wading through all of the data constantly being loaded onto Internet sites can be a time-consuming and tedious, but necessary task when researching a potential investment. Even more, data is produced daily, multiplying exponentially the already enormous amount of obtainable electronic information. Wise Business Plans’ experts systematically examine all available data so that you don’t have to, using the latest analytical and marketing information collection tools to interpret what they find and gathering the most up-to-date fiscal and statistical data to convey a definitive picture of your market and assess the full scope of a particular project. Each EB-5 client’s desired result is always at the forefront of the entire research and development process, from start to finish. The Wise Business Planning team employs a step-by-step approach to research, detailing, analyzing and explaining all facets of a project in complete accordance with the desired outcome of the investor. The resulting information is then presented in a way that makes future projections and financial goals clear and fulfills the expectations of the client. By tapping into the global reservoir of information to draw forth the most relevant data models, the Wise team is able to sift through information to review, evaluate and then meet a client’s EB-5 needs for USCIS. The result is a high-quality plan that is not just informative, but provides a premium outcome backed by solid research and informed, expert documentation. Wise is committed to working with clients in the development and completion of all levels of the EB-5 process, including performing market analysis; reviewing the center’s potential commercial and economic impact; working to understand and meet investor concerns and government regulations; and collaborating to envision the EB-5 business ideas and requirements that each client’s project entails. Once a Regional Center is approved, immigrant investors can apply for the EB-5 green card. Becoming part of a Regional Center Program is a good choice for the retired investor or one who isn’t interested in direct management because of the reliability and sense of security that USCIS offers investors, the advantages of being an investor without having to employ people directly or create individual job opportunities as an individual and the ease of becoming an investor with a somewhat limited role in the day-to-day operations of the project. There are many options available to Regional Center investors. The fact that a center has been government inspected, so to speak, and that members are willing to put their own financial and professional assets to work toward the EB-5 process, shows a commitment to the overall EB-5 program and the collective success of investors. Endeavoring to run a productive project, keeping up with government regulations and meeting the financial expectations of the group, in the end, assures that the investors immigration processes will be completed, and better a financial future earned for everyone involved. There is no direct job creation requirement for investors who are members of a Regional Center, as opposed to the direct EB-5 program. Instead, the investor must simply satisfy stipulations by showing that 10 jobs will be made or preserved in the Regional Center area as a result of the center, as shown by an economic impact review. Simply by making a largely inactive investment in a limited partner role, EB-5 investors can meet government management regulations while getting a secure start on the ongoing process of becoming a resident. This is an attractive option for foreign investors, such as immigrants wishing to mainly concentrate on gaining permanent residency and not wanting the burden of involved in everyday decision-making processes. In this manner, the Regional Center helps protect the investor by controlling the financial liability of each individual involved, limiting his or her liability to the amount originally invested. EB-5 Regional Centers applications are given priority over traditional EB-5 requests, because they can live and work anywhere in the United States, regardless of where the Regional Center is located. An investor’s spouse and dependent children may also live permanently in the country, work and go to school, unrestricted. The EB-5 Investor Green Card application is usually an uncomplicated process, though the assistance of an immigration attorney is necessary. The origin of investment funds must be verified by providing the last five years of income tax returns and a completed I-526 application form. Investors are required to show, through official bank records, business invoices and receipts or other acceptable credentials, that capital to be invested is being transferred from the original investor to an EB-5 project. The investor may use his or her own private funds, money secured through a loan, or money acquired as a gift. Getting approval for I-526 petitions can take several months for Regional Center applications, and longer for a direct EB-5 application. 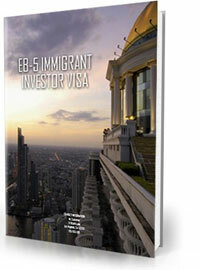 Investors must accomplish the due diligence for an EB-5 project. Then an investment is made, and the investor’s I-526 petition is handed over to USCIS, requesting that USCIS certify that both investor and investment are qualified for EB-5 status. If USCIS agrees to the investor’s request, a Conditional Green Card is issued for 30 months. Within two years of the conditional Green Card being issued, investors will be asked to certify that an investment has taken place and that the full-time job creation requirements have been reached. At that time, the investor may apply for removal of the conditional restriction on his or her Green Card status with the USCIS. Upon removal, an unconditional Green Card will be issued, granting permanent resident status in the United States. At such point, investors may sell, or dissolve, the original investment, as long as Regional Center regulations and terms are followed. After fulfillment of U.S residency requirements, permanent Green Card holders may expect to gain U.S. Citizenship, usually after about two and a half years. EB-5 Regional Center programs can truly mean success for the investor who seeks a fast track to Green Card acceptance and permanent residency without the constraints of managing full-time, hands-on investments. All of this, while living anywhere in the country and keeping the family together, make the program a very good option for many investors. And job creation, revenues, financial distribution information and information about the investor and his or her family must be ready for USCIS review upon request. If they are unable to show current employment reports and offer offer-to-date, verifiable information on the location of foreign investors and their status, Regional Centers can lose their designation. This information must be available on demand, as USCIS may visit at its discretion. It’s enough to leave any experienced business owner reeling. For someone newer to entrepreneurship in the U.S., it can be almost paralyzing. It’s in these moments that good planning becomes absolutely vital. A smoothly running company not only allows for easier record-keeping and information at your fingertips. It also makes it easier to find time and resources to manage the meticulous record-keeping necessary to stay compliant and meet or exceed USCIS reporting expectations. Wise EB-5 Business Plans are carefully constructed to build the kind of infrastructure and personnel and financial modeling that makes it easy to create, manage and maintain reports and information vital to retaining EB-5 Regional Center designation. Our plans are living documents that allow for easy, at-a-glance information gathering. And we stand ready to make updates or assist with changes as the Center grows. In addition, to being a recognized leader in the business planning and consulting industry, Wise Business Plans employ MBA-educated writers with a wealth of experience in assisting clients with visa approval processes, particularly related to EB-5 Regional Centers. Wise has been a partner in success with companies and investors from around the globe, working to create centers of distinction throughout the country. Our consultants and plan writers can help you navigate the often complex and confusing world of government regulations, helping you get approved and remain compliant. Our specialized EB-5 plans offer techniques that take some of the guesswork out of taking part in the EB5 initiative. And, since creating jobs is a key requirement of the program, we assist each EB5 business plan client with understanding their expected staffing needs to ensure that they can support and maintain the direct or indirect job creation numbers necessary for sustaining the Visa or maintaining their Regional Center designation. And the in-depth demographics research within your EB-5 Plan offers newcomers a valuable, multi-layer view into the market environment they hope to enter. According to USCIS, as part of the I-526 petition, an EB5 investor must submit a comprehensive business plan showing the need for at least 10 qualifying employees for every $1 million invested per applicant. Likewise, for a targeted employment area (TEA), an EB5 investor must submit a comprehensive business plan showing the need for at least 10 qualifying employees for every $500K invested per applicant. The Wise EB5 Business Plan, at approximately 40-50 pages in length, include full-color charts and graphs, and is comprehensive without being overwhelming. Our plans are easy to follow and made to be both eye-catching and functional. Demonstrating the economic impact of a proposed EB-5 Regional Center is a key required portion of the application process, and it goes hand-in-hand with outlining the center’s expected job creation numbers. The first step in understanding — and thus, illustrating — the economic impact of a proposed center is a forward-looking business plan and analysis that outlines personnel requirements, expected market reach and other aspects of the center’s formation that directly or indirectly create jobs and build revenue. The MBA-educated experts at Wise have decades of planning and financial preparation experience that, when combined with cutting-edge market analytics and a deep understanding of the requirements for setting up a successful EB-5 Regional Center, can help create a vivid, informative portrait of the proposed center’s induced, indirect and direct effects on the regional economy. Careful projections of salary expenditures, management and leadership positions and the center’s employment structure, alongside in-depth demographics studies showcasing the strengths and needs of the area in question, ensure that projected jobs are realistic and sustainable, allowing for confidence in the economic analysis and a firm understanding of the center’s expected economic impact. To learn more about the components in each Matter of Ho-compliant EB-5 plan,click here,for a quote.